Those born under the signs of the Chinese zodiac signs horse and dog are actually one of the easier matches. Anyone in a relationship with a horse usually has to show some compromise and understanding. The traits of these two fit together so well that very often what would push others away only seem to make them stronger together. The dog will have issues with mood swings sometimes, but this is something that doesn’t bother the horse. The horses can also be prone to having mood swings, so they will inherently understand when the dogs exhibits the same behavior. The horse and dog in love tend to make a very easygoing couple together. They have a lot of fun together and the individual signs tend to be pretty cheerful and contented. They aren’t very domestic, both preferring to instead be out with friends and each other. Horses are deeply seductive, clever, and charming. They love their partner for their ability to be analytical. They too have a good bit of knowledge, but over a wider area of topics. Very often they want to learn more and they will feel they can take in a lot of knowledge from the lover. They are less likely to be offended by their partner’s honesty, which might be a hard truth to swallow at times. The dog tends not to waste time on prattling. They spend more time on delving into the more complex subjects that cause the them stress or even those that motivate them. While they like going out, they can also like a night in. They are devoted, genuine, and heartfelt. They are not such idealists as to just discredit the horse’s traits but rather accept that their partner is impulsive and erratic. In a romantic horse dog relationship, they don’t like staying home very much. They feel they don’t need the quality alone time together and tend to enjoy going out quite often. When the horse is dating the dog, they are fine with this arrangement. They both desire continual invigoration and variety in life. According to Chinese astrology, horses will find it difficult to stay in long-term relationships. Despite this part of the their nature, they are genuinely happy with the dogs and the urge to roam does not manifest as soon as it might with other signs. They see them as an enigma and this appeals greatly to them. The male or female dog’s sporadic mood swings and appearances of ire actually amuse the male or female horse. They tend to find it interesting. Sexually the horse and dog in bed will have an intense physical attraction and won’t find it easy to shake each other off, though they may try from time to time. The horse and dog soulmates still need to maintain their own areas and independence. They are both active and expressive individuals. They both will find happiness in this love compatibility pairing. The dog will routinely observe the horse’s instincts and will find their understanding and perception impressive. Out of any other Chinese zodiac sign that might fit with the horse, the horse dog marriage will provide balance to each other. The horse man will push the dog woman to take more risks and be more active in their mutual social life. On the other hand, the dog woman will be willing to show the horse man that it isn’t necessary to always be out and about. The horse adores the dog’s ability to laugh at most anything and their sense of rationale. Because of this understanding, the horse and dog friendship can form a happy, long-lasting relationship with no worry of a breakup. 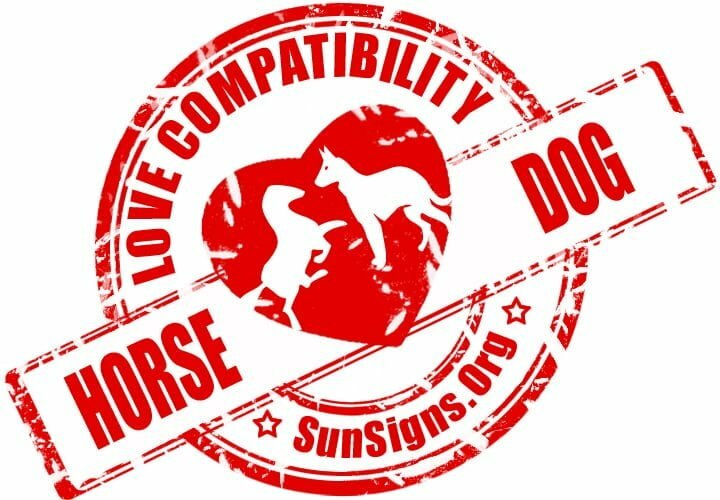 Horse & Dog Chinese Horoscope Compatibility Rated 5 Hearts!